Who are we? | Kennel Ridge Rules! Just outside the city of Stockholm, on a mountain, in a almost blue house I live together with my husband Robert, his son Simon and 5 rhodesian ridgebacks. Our RR´s are calm, sociable and loves to lay in our beds our couch and cuddle with us. They guard us and the house so we feel safe, but as soon as we tell them that the guest is welcome everything calms down. I was born on leapday in 1972 so I am much younger than everyone else ;) I am a physiotherapist who became a sales rep working with human implants like knee- & hip joints. On the side I continued to educate myself within dog-rehab. I meet my first RR in 1996 and in the spring of 1997 the first puppy came in to my life, "Ikko" from Ökensandens Kennel. Puppy number two came a year later and became my own, Rex Ventors Akeron. "Akeron" and I found a mutual interest and that was dog shows. He was a true showman and we travelled around a lot winning some and loosing some. Due to "Akerons" talant and my competitive instinct I have shown dogs in many countries around Europe such as Great Britain, France, Holland etc. I have also competed in obedience and tried blood-tracking with our RR´s. 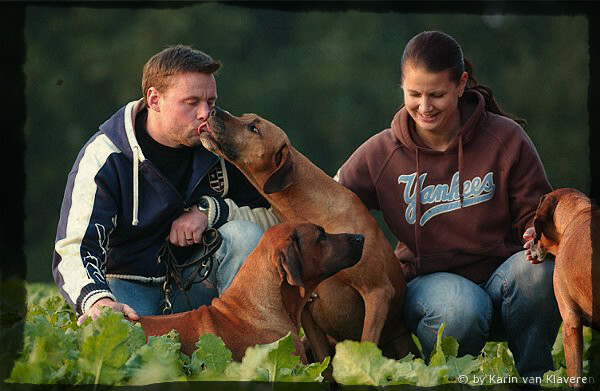 I have been in the bord of the Stockholm Rhodesian Ridgeback Club several timeas and for a couple of years in the central comitte for the Swedish Rhodesian Ridgeback Club. To work with the breedclub has given me lots of knowlede, insight and contacts as well as many good laughs! For the past 6 years I have also had the opportunitie to lead handling classes for both beginners as well as more advanced handlers and their dogs. Also a great way to learn about dogs and the communication between human and dogs. In our everyday life Robban does his part of taking care of the dogs and he is the one who attends to them when I am away with work. Other free time is spent with coaching american football, working on his Chevrolet Nova or his two budgies Åsa and Nisse.